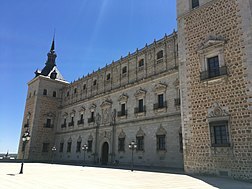 The Alcázar of Toledo (Spanish: Alcázar de Toledo, IPA: [alˈkaθaɾ ðe toˈleðo]) is a stone fortification located in the highest part of Toledo, Spain. Once used as a Roman palace in the 3rd century, it was restored under Charles I (Charles V, Holy Roman Emperor) and his son Philip II of Spain in the 1540s. In 1521, Hernán Cortés was received by Charles I at the Alcázar, following Cortes' conquest of the Aztecs. Most of the alcázar was rebuilt, or restored, between 1939 and 1957 after the Siege of the Alcázar of the Spanish Civil War. View of the Alcázar in 1866 by Casiano Alguacil. During the Spanish Civil War, Colonel José Moscardó Ituarte held the building against overwhelming Spanish Republican forces in the Siege of the Alcázar. The incident became a central piece of Spanish Nationalist lore, especially the story of Moscardó's son Luis. The Republicans took 16-year-old Luis hostage, and demanded that the Alcázar be surrendered or they would kill him. Luis told his father, "Surrender or they will shoot me." His father replied, "Then commend your soul to God, shout 'Viva Cristo Rey' and die like a hero." Moscardó refused to surrender. Contemporary reports indicated that the Republicans then murdered Moscardó's son. Other historians have reported that Luis was not in fact shot until a month later "in reprisal for an air raid". The dramatic story also camouflages the fact that the fate of a number of male hostages, mainly from the Guardia Civil, taken into the Alcázar at the beginning of the siege is unclear. Some sources say the men "were never heard of again". However at least one journalist who visited the Alcázar in the immediate aftermath of its liberation saw a number of prisoners chained to a railing in a cellar. The events of the Spanish Civil War at the Alcázar made the structure a symbol for Spanish Nationalism and inspired the naming of El Alcázar, a far-right newspaper that began during the civil war and ended during the Spanish transition to democracy as the mouthpiece for Búnker, a faction of Francoists who opposed reform after Francisco Franco's death. By the end of the siege, the building had been severely damaged. After the war, it was rebuilt. It now houses the Castilla-La Mancha Regional Library ("Biblioteca Autonómica") and the Museum of the Army ("Museo del Ejército"), the latter having previously been housed in the Salón de Reinos in Madrid. Heinrich Himmler visits the Alcázar with José Moscardó in October 1940. Interior of the Alcázar in 1901, Jean Laurent. ^ Henry Kamen, Philip of Spain, (Yale University Press, 1999), 184-185. ^ Toledo and the New World in the Sixteenth Century, Javier Malagón-Barceló, The Americas, Vol. 20, No. 2 (October 1963), 124. ^ "The Siege of the Alcazar, Toledo, Spain. 1936". www.idealspain.com. Retrieved 2018-02-22. Hugh Thomas, The Spanish Civil War, 4th Rev. Ed. 2001. Antony Beevor, The Battle for Spain, 2006. 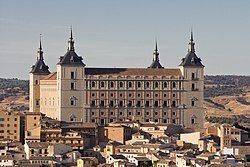 Wikimedia Commons has media related to Alcázar of Toledo.